It happens to the best of us, and it can happen without even noticing it. We can easily fall into the habit (or rut) of only exercising certain muscles in our body. While some muscles get all of your attention and effort, others go forgotten. Falling into these habits can happen especially during certain seasons, like winter. Let’s talk about why it’s important to shake it up your exercise, and a how CBRC can help. Spring and summer, here we come! We all know that exercising and taking care of our bodies takes time, and energy (and a few other things of course). If you devote all of your effort to strengthening only one area of your body (like legs, arms, or core), naturally other areas will be less exercised, even weaker. Why is it important to shake up your routines and exercise different areas of your body? First, you can help prevent against overuse injuries. Do you always get tennis elbow, tendonitis, stress-fractures, or inflammation in certain areas? Switching up your exercises and focusing on other muscles may help prevent this! It is also important to shake up your workouts, because it can prevent your body from plateauing – where you may stop seeing results. In addition, shaking up your routines may allow intensely worked muscles groups (like legs) time to rest and repair in between workouts. CBRC is truly a “one-stop-shop.” We’ve got you covered for tennis, racquetball, personal training, swimming, alloy group training, weight lifting, karate, group fitness, and more! With so many great exercise options to choose from, you’ll find it easy to shake it up and try something new. Are you a fair weather runner? Haven’t run outside all winter since it’s been cold? It’s time to start warming up those legs! Start building up your running endurance at CBRC. We have two indoor tracks, plus a great cardio room! Remember: you don’t want to overwork, or only focus on legs though! Consider some group exercise classes, like Yoga or Pilates for some great variation. Do you love to garden in the summertime? Haven’t been on your hands and knees out in the garden since last summer? Consider coming to group exercises classes to work out an array of your muscles. You may like to try CXWORX to strengthen your core! As always, CBRC personal trainers are a great resource to guide you along your fitness journey and get fit for any activity. Whether it’s training for a marathon, or just everyday fitness, CBRC is here to help you make it happen. 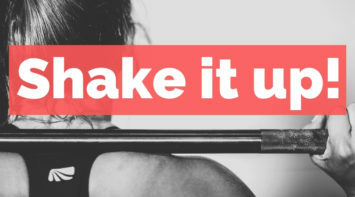 Have fun shaking up your workouts this spring!